I love to try new things in the kitchen. New flavours, and food textures as well as fun combinations. It’s always great to taste new and exciting foods, especially when they are made up of ingredients commonly used in my kitchen, but not normally paired together. 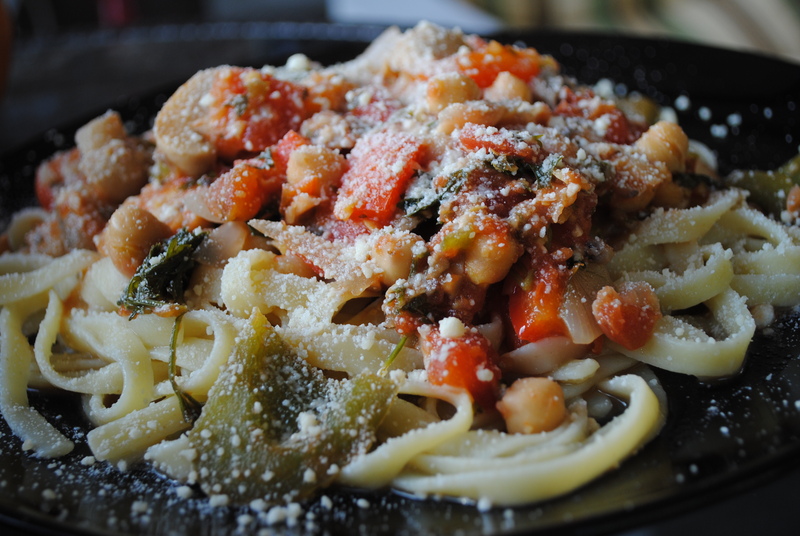 I’m not sure why before today I had never paired pasta and chick peas. It seems like a great combination, and both of these things I use very regularly. Indeed after searching for recipes with both ingredients I learned that Pasta e Ceci is actually a well-known Italian dish. In a large frying pan, heat oil and add garlic and onions and fry to cook slightly. Next add spices, tomatoes, peppers, mushrooms, parsley and chick peas with their liquid. Allow to simmer uncovered on medium heat for about 15 minutes. Transfer to a large stock pot. With a hand blender, quickly blend a little bit of the sauce right in the stock pot, just so that you’ve processed some of it to make it smooth, and still leave most of the sauce chunky (you just want to thicken the sauce a little by pureeing a bit of it) Continue to cook sauce for another 15 minutes or so, covered. Cook pasta until done, and portion onto plates, topping with sauce and grated Parmesan or Romano cheese. Making a pasta e ceci recipe next week – fun to see the delicious variations.